- July started out a little flat, I'm not talking about hiking, I'm talking about my Jeep! On the way to meet my friend Kelsey, her boyfriend Ben, and their dog Chewbacca for a Sunday hike up Moosilauke, my air pressure warning went off a half mile from the Moosilauke Carriage Road Trailhead, my right front tire was losing air. If you have ever been on that road it's dirt and uphill, not the place to get a flat, so I immediately turned around and luckily made it to a gas station in Warren and changed out the flat. Good news with the Jeep is the spare is a full size so I wasn't too worried. Unfortunately this put me way behind and I wouldn't be able to catch up with Kelsey, Ben, and Chewie so I decided to start heading north towards home and hike something small to save the day. - I decided on Mount Hale via the Mount Hale Trail (AKA Fire Warden's Trail). It was a very pleasant hike as I haven't been on this abandoned trail without snow in a few years. It was even breezy and cool which made for a comfortable summer hike, and to top it off I didn't see another hiker on the old trail or at the summit while making good time up and down. - Unfortunately my day was far from over, as soon as I turned off Haystack Road onto Route 3 my air pressure light went off again, another flat, this one was the front left tire and the air was leaking out fast so I was in a bit of a pinch. I quickly texted my friend Kyle, who was up hiking and staying at my place in Gorham to come get me at the Zealand Road winter lot off Route 302. I chose this lot because I wouldn't have to worry about my Jeep if I had to leave it overnight. - Kyle picked me up and I loaded the first flat into his car and we headed to the closest place that could plug a flat. Time was of the essence as it was Sunday afternoon and Monday was a holiday. Luckily we found a place twenty minutes before it closed and got the first flat plugged and headed back to Zealand Road winter lot and switched flat number two with plugged flat number one...What a day!! 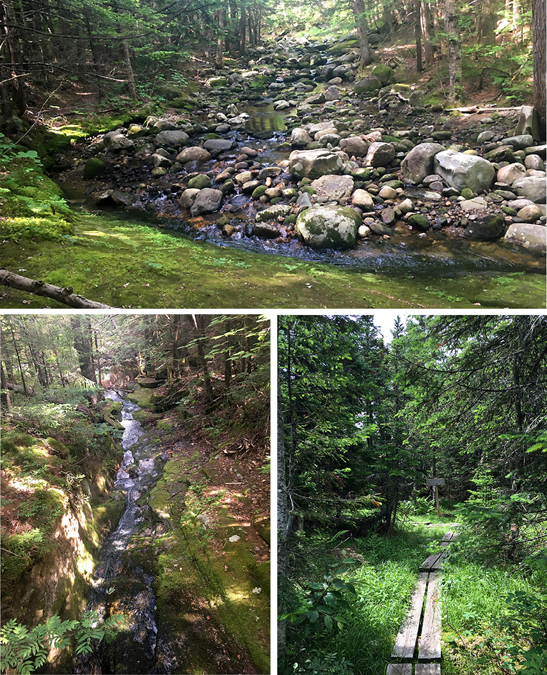 - On Independence Day, Kyle and I did a modified Kilkenny Range Traverse, instead of starting at South Pond we started up the Unknown Pond Trail. 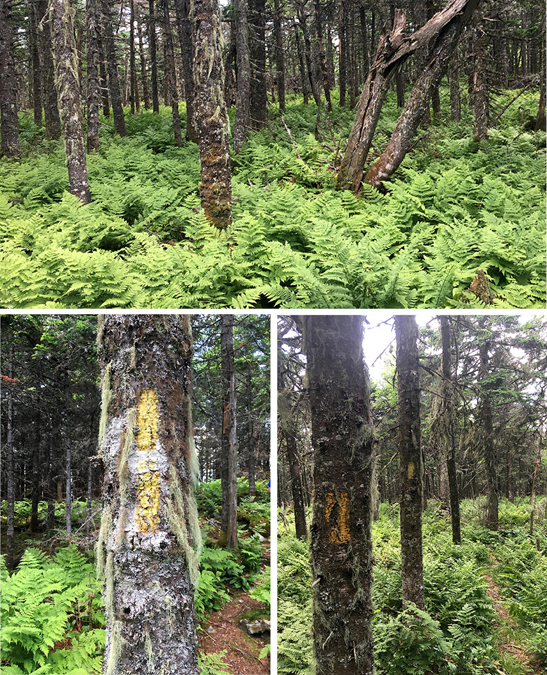 The Kilkenny Ridge Trail between the Terrace and Weeks Range is filled with lush green oak fern which completely blankets the floor of the forest only leaving a narrow gap where the trail snakes through. 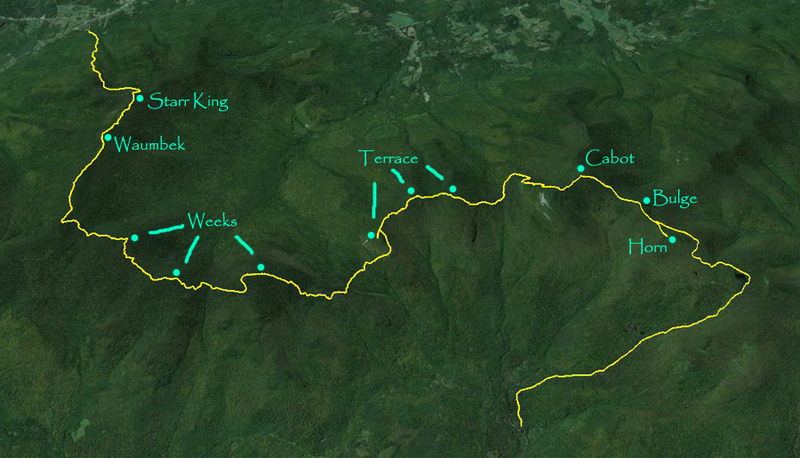 - There are only a couple of views throughout this route, The Horn, Bunnell Rock, Mount Waumbek Outlook, and Starr King. It ended up being a great morning and early afternoon hike as Kyle and I had a fun time traveling through the woods from the Berlin Fish Hatchery and finishing at the Starr King Trailhead. - I woke up very early and headed across the street to hike Mount Moriah, I decided to do a little off trail exploration, I found a semi-deep gorge but soon ended up very close to private property so I had to head back to the trail before I scared some unsuspecting family. The rest of the hike went as expected, I had great views from the Moriah ledges on the Carter-Moriah Trail, saw a bear dash off in the woods, and stumbled upon a forest service car about a quarter mile up the old logging road which I use as a shortcut, they were doing trail work at the water crossing a mile into the Stony Brook Trail. - Unfortunately it was now very hot and humid and within minutes I was sweating bullets. The Greeley Ponds parking lot was full so I took the old lower link of the Greeley Ponds XC Ski Trail, I wanted to take the marked XC Ski Trail but there were signs saying no foot travel. I don't know if that meant winter or all year but I didn't want to take a chance, anyway the old lower link was a mixed bag, half was great for hiking while the other half was filled with Adirondack type mud. - Even though it was hot and humid I had a great time hiking both peaks and came across a dozen or so happy hikers and a few dogs who were holding up well in the heat. - I was going to take off from hiking with rain and wind forecasted, but Kelsey was going to get in a quick hike while her boyfriend biked. I was dying to meet her dog Chewbacca so I decided to tag along for a morning hike up Mount Pierce. 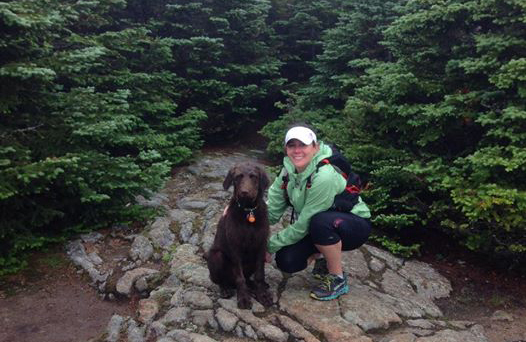 Chewie is a Chocolate Lab - Poodle mix and was very well behaved and did a great job hiking his second 4K peak. The weather was cloudy and misty but overall it wasn't too bad and I had fun catching up as I hadn't seen Kelsey in almost two years. - I headed to Jefferson Notch after work for a hike up the Caps Ridge Trail. The weather was great and so were conditions as all the boulders were dry making it very easy to scramble up the caps and rock hop up the summit cone. Views were great and there was a nice breeze as I stayed on the summit for about ten minutes enjoying the views before hopping back down to the trailhead. I was also pleased as my Jeep's tires held up well driving up the narrow dirt, and rough in spots Jefferson Notch Road and nothing sprung any leaks, meaning I must have been unlucky and ran over screws last week and there was not something horribly wrong with my tires! - I made my yearly trek up the 'Express Way' to Mount Washington, the Tuckerman Ravine Trail. Since this route is usually a mob scene I waited until 4PM to start hiking, I ran into a few dozen people on the way up to Hermit Lake but from here until the floor of the ravine and then skirting up the headwall to the lip I only saw a couple of hikers and basically had the whole trail to myself. Once reaching Tuckerman Junction I saw a handful of stragglers inching there way down the mountain as I reached the top. I arrived just before 6PM and watched the last three cog trains descend from the observatory deck. - After relaxing and taking in the views I headed down to Lakes of the Clouds where I could smell the food from dinner being served at the hut, which made my granola bars and gummies seem very inadequate as I motored past and up to Monroe's summit. On the summit there was one other hiker who told me it was his first time on Mount Monroe, I told him he couldn't have picked a better day to be up here! 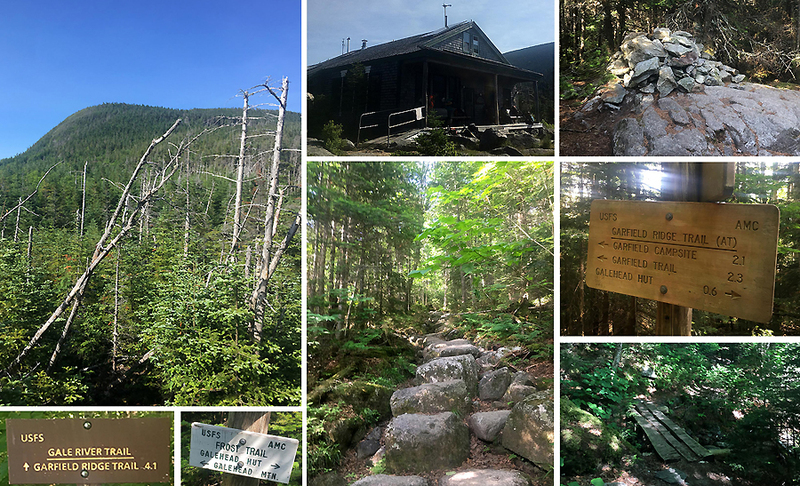 - From the summit of Monroe I headed back to the hut and then made my way back to Pinkham Notch via the Camel, Davis Path, Boott Spur, Boott Spur Link, and Tuckerman Ravine trails. Other than a naked guy washing himself in the water at Lakes of the Clouds I saw no one until the last mile of the Tuckerman Ravine Trail. Some other highlights of the hike back to Pinkham was stopping by the site of the old emergency shelter along the Camel Trail, enjoying the magnificent cairn work along the Davis Path, taking in the huge views below the Boott Spur, and watching the sun sink behind the lip of Tuckerman Ravine as I descended the ridiculously steep Boot Spur Link. - As you can tell, my first summer living in the mountains has gotten off to a great start, the weather has been excellent and not too humid so there really have been no threats of afternoon thunderstorms above treeline. However, Wednesday the humidity came rolling in with a vengeance but the clouds didn't look too menacing as I made my way towards Franconia Notch so I decided to push myself and hike the whole Franconia Ridge. - I started up the Old Bridle Path towards the Greenleaf Hut around 4PM and by the time I reached the hut I had sweated through my whole shirt. Once breaking above treeline for good I welcomed the light breeze and warm temps as I watched in caution the clouds building up from the west over the Kinsman Ridge, luckily none of them looked threatening so I was good to go. - For the third straight day the trails were mostly empty in the late afternoon hours as the sun started to slowly lower to the west. - The section between Lafayette to Little Haystack becomes an instant classic for every hiker that gets to travels along the ridge on a clear day with 360 degree views. While most hikers drop off Franconia Ridge at Little Haystack via the Falling Waters Trail, the ridge continues another three miles to the summit of Mount Flume, however unlike the first section that is above treeline this section is almost completely in the woods except for the summit ledges of Mount Liberty and Flume. Even without the views the trail is very attractive and the footing and grades are mellow for much of its length. - From the summit of Flume I made the steep descent down the Flume Slide which now has well beaten herd paths on each side of the slide in the woods. Even though this doesn't bother me that much I do find it a little puzzling as a hiker doesn't need to summit Flume from this trail, so if you're not up to scrambling up a difficult trail you can take the Osseo Trail from Lincoln Woods or do an out and back from Liberty rather than tearing up the woods off trail. As for the slide it was pretty greasy with the humidity so I had to be careful heading down it but it wasn't too difficult to descend. - One last hike before the big dual finale hike (Grid & 4K #1000). I decided to check out part of my finish route that I was unfamiliar with, the Dry River Cutoff and Isolation West Trail. These trails travel to and from the ridges that sit high above the Dry River Wilderness. Both trails are lightly used and sections of each trail are under sub par conditions. The Dry River Cutoff has muddy and narrow sections on the upper half, while Isolation West is eroded and washed out from Tropical Storm Irene for it's lower half. However both trails are pretty easy to follow as long as you're paying attention, especially at the river crossings. - The rest of the hike was mostly above treeline but the cloud deck was low ruining any chance for good views. However, there was a nice breeze and the temperature was in the low to mid 50's from Boott Spur to Mount Eisenhower which made for a nice escape from temps in the valley that were hot and humid. - Lakes of the Clouds was jamming as I passed by it around 1PM, I had never seen it that busy inside during the day, usually most hikers are milling around outside everywhere. 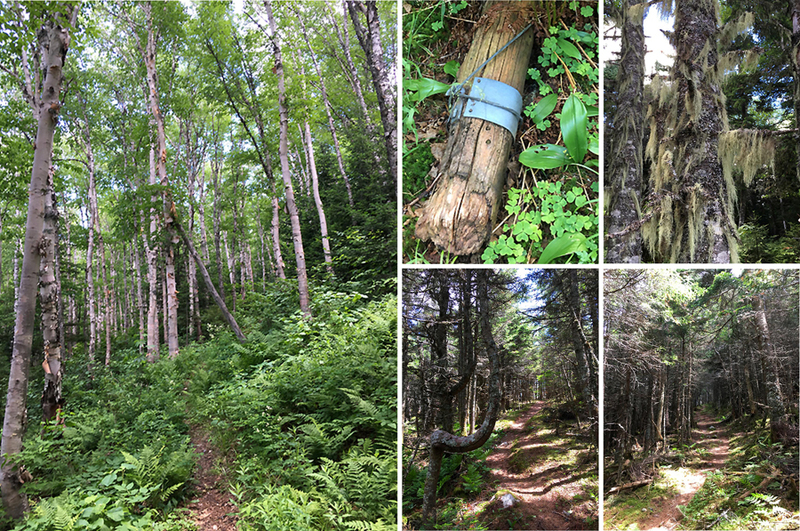 Once past Lakes I had the trail to myself for the most part until after Mount Eisenhower where I started to run into dozens of people as I made my way back to Crawford Notch. - It ended up being a good recon hike for my finish...now I wait for a clear and dry weather window! Davis Path, beautiful cairn work! Dry River Cutoff, looks so pretty until your foot sinks a half foot in! Dry River Cutoff, just a little muddy!